She was up barfing at four. When I arrived hours later, she had pink cheeks, a kitty ears headband, and was play-ready. She assured me it wasn’t really being sick to barf, but pre-school wanted her to stay home. She was sad Mom wasn’t staying home, sad to miss her friends, but game for whatever Grandma brought to the day. Lemon-lime soda was no longer needed. Water was fine. Munching many plain saltines and a cup of dry cereal made up for a missed breakfast. Within minutes we were on the sofa deep in a Brain Quest card deck working through sequencing challenges, adding, matching letters and words, talking about calendars and telling time on old-fashioned round clocks. Those clocks sparked the first pronouncement of preschool wisdom. She thought I must have had a clock with numbers in a circle because I am old. I corrected that statement to older. She didn’t buy the change. A teenager had given me the same look when I asked if the general store in a small town carried watches. With interest in Brain Quest waning, I suggested we start an art project. She turned down the idea because she said she loved to learn things. There wasn’t anything better she could have said if she hadn’t finished with a sympathetic sigh before sharing that it was sad that old people couldn’t learn stuff. That’s not true I replied and told her about a friend who learned another language to work with immigrants, another friend attending university classes, my own tap-dancing studies. She frowned and said maybe I had special friends. That I do. Even at her age I couldn’t do backward summersaults, so she had me at that, but I didn’t expect to frighten her when I got down on the floor to do a plank next to her. Old people could get hurt doing planks she said. I replied anybody could get hurt doing planks, but we were both strong because we could hold a plank for almost a minute. Then I sat back to watch her attempt head stands and intricate twirls. We rounded out the day with dressing the cat, coloring paper dolls, and baking a chocolate cake. She looked tired, but happy. Her mother looked tired after an important work day. And grandma drove home, happily tired out after an unexpected play day. 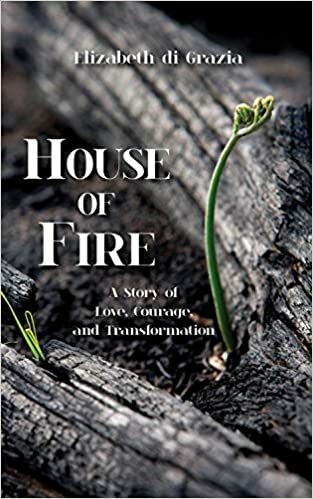 When my husband said, “Middle age is the richest time,” I thought, “No way.” Too often, middle age feels like loss—of youth, of a sense of possibility, of elders I love. No denying, those really are jowls, and since I’m not inclined to have plastic surgery, they’re here to stay. Lovely. The big 6-0 isn’t that far off and I meant to have accomplished more—published more for sure. My 92-year-old Mom is slipping a lot faster. Her short-term memory has gone on strike, so we have the same conversations again and again. “Are you coming for the baby shower? No Mom, I can’t. I’ll be in Arizona that weekend,” and the next day, “Are you coming to the baby shower? No, Mom . . . ” At 90, she managed her household and finances. Now her kids take care of that. To be expected, but still. I miss her smart competent self. As Dad, who died three years ago would say, “Aging isn’t for the faint of heart.” No kidding. So I had to know why my husband, who isn’t prone to positive affirmations or yippee-skippiness of any sort, would say middle age is the richest time. “Because at middle age, you can see forward and you can see back. 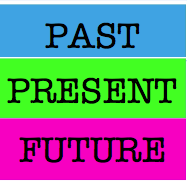 We can vividly recall the experiences our kids are having and we can see how it we’ll be in 30 years.” Hmmm, maybe. When each son moved to his first apartment, I recalled how much fun it was to make a place my own. Like mine, their places were furnished with a combination of hand-me-downs and the discount store shower curtain and towels they chose for themselves. When they talk about their girlfriends, I remember the low hum of excitement I felt when I was going out with someone new. I know what a milestone it is to realize that even though I had a fight with the guy I was dating, we worked through it and we were still together. So I pull back from the brink. This man, this life. I am rich. How do you view middle age? If you’re not there yet, what do you expect? If you’re already middle-aged, what’s it look like? Recently I had dinner with my friend C., who mentioned that after years of freelance writing, she was interviewing to be a marketing communications manager—a position she’s eminently qualified for. She confided that during the preliminary phone interview, the interviewer expressed concern that C. wouldn’t be satisfied with being a mid-level manager. Perhaps C. would be uncomfortable taking direction from the younger director of the organization. C. paused during this anecdote, with her eyes wide and eyebrows raised. We both burst out laughing and couldn’t stop. “Being the director is the last thing I want! I just want to do the kind of work I’ve been doing . . . but someplace else. For me, learning the rhythms of that office will be challenging enough,” C. said and paused for a sip of white wine. “I know! I just want to do interesting work with coworkers I like and be respected for what I know,” I said. I’m not sure when I lost my ambition for climbing the corporate ladder, but it’s been gone for a while. Even saying that feels odd. I have always cared about my career, and I’ve gone to some trouble to have one (got a graduate degree, made several cross-country moves in pursuit of jobs, been a working mother). But I simply no longer have a driving need to be promoted. Unlike Sheryl Sandburg, who encourages working mothers to be all they can be career-wise (see Lean In), I leaned back a long time ago. a) It gave me the flexible hours I wanted when my sons were growing up so I could be a bigger part of their lives. They spent fewer hours in daycare. In the summer, I’d occasionally knock off early and we’d go on excursions—the beach, the zoo, or the park. When they were sick, I’d be home. I still had deadlines and needed to work late after my husband returned from his job, but it was easier to manage. Plus, I could volunteer at their school and go on their field trips. b) With half a dozen clients, I could have the creative variety that’s often lacking for ad agency copywriters. Instead of being the head writer on the agency’s Visa team, I’d write for Land o’ Lakes, Visa, Radisson, Medtronic, Sears—whichever account was active that week. c) As a freelance writer, I had more free time to write personal essays and memoir pieces—the kind of creative writing I’d always wanted to do. I made choices that supported the life I wanted; my decisions did not advance a traditional career path. Shortly after my second son was born, while I was still working full-time, I was offered the opportunity to be promoted from senior copywriter to associate creative director. It was hard to say no—at that point I still had traditional ambitions and wanted to advance. But I turned down the promotion, because between work and family, I was already at or beyond full capacity. I simply didn’t have the energy to do more and to do the job justice. Several years ago, I chose to leave my freelance business behind (it stopped being as much fun and my sons were grown) and take a part-time job writing marketing communications for a children’s hospital. I’ve had several chances to go full-time and get back on the classic path to career advancement. Ambition flickered in my heart. I briefly heard the siren song of advancement, “You’ve got more in you–you’d be good at that job.” But I leaned back again. As I told C. during dinner, “Hiring managers don’t have to be so worried about Baby Boomers. A lot of us don’t want to take over anything. Work is just one of the things we care about. We have a number of priorities. C. and I raised a toast to that reality. 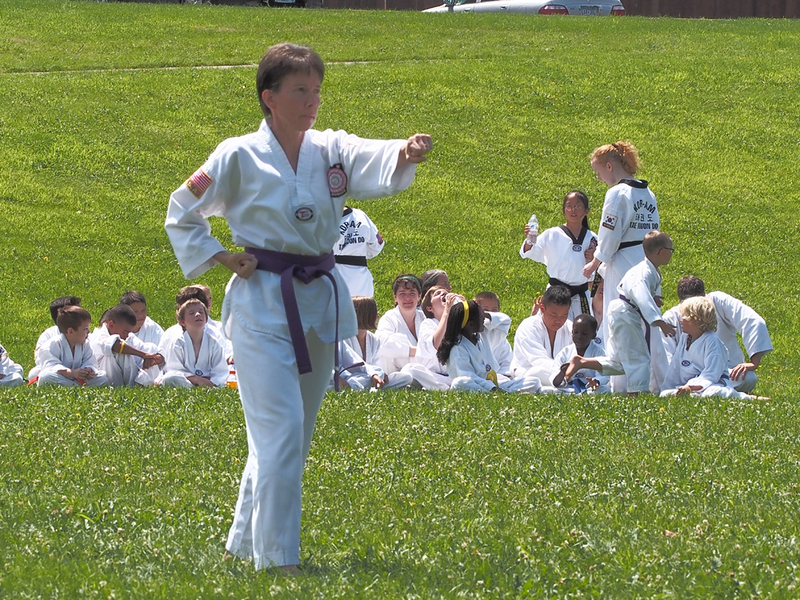 I started Tae Kwon Do, at Kor Am Tae Kwon Do School when I was 50 years old. Yes, it was an age thing, time to do something new, challenge myself, and show the world that I’m really not all that old. For four years, I had been sitting with my back against the Do-Jang wall watching Antonio and Crystel progress through the belts. When they became black belts I decided to join. 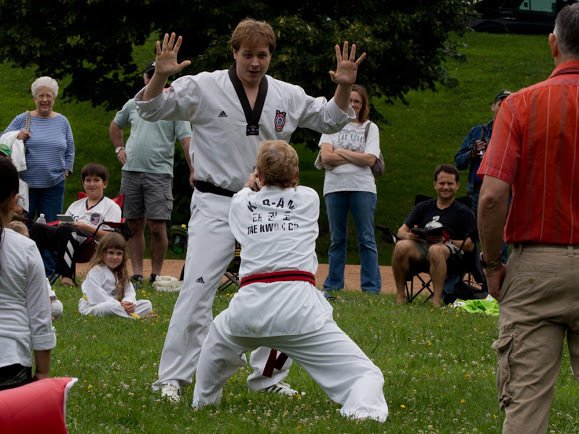 I told myself and others that it was to help keep the kids interested in Tae Kwon Do. Really, it was because I secretly wanted to join and it took turning 50 to gather the courage. Not that Antonio and Crystel didn’t liven up a bit when they watched me put on the stiff white uniform. Crystel got this sparkle in her eye. I knew I was in trouble then. 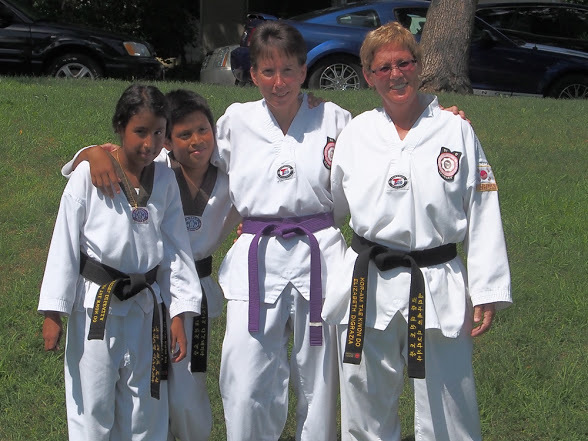 Because they have a black belt, they outranked their mom. When they weren’t telling me what to do they were laughing. I always seemed to be a kick behind, a jump behind, a punch behind and pointed in a different direction than the other students. I thought I might be the first person who didn’t progress from a “no-belt” to a white belt. It was a source of pride for me when after five classes that white belt was placed around my midsection. At Kor Am Tae Kwon Do, the adults and children take classes together and I’m sure that my smile was just as wide as the five-year-old that started class at the same time as I did. And, I’m pretty sure he was already better than me. The exercise time that I spent running was now being eaten up by three to four classes a week at Tae Kwon Do. At first, I was disappointed. I wasn’t getting the same type of workout. Doing Tae Kwon Do, I wasn’t even sweating. I was such a klutz in class and had such a slow learning curve that it was a personal challenge just to show up and take my place at the back of the room. I persevered and started noticing benefits. With the twenty minutes or so of exercises that we did at the beginning of class I found that I was able to stretch my legs more than I had in years. I also felt more in tune with my body. We used so many muscles groups exercising that I knew myself better. So, even though, I was only running on the weekends, I felt like I was in better shape because I was just so much more aware of my whole body. 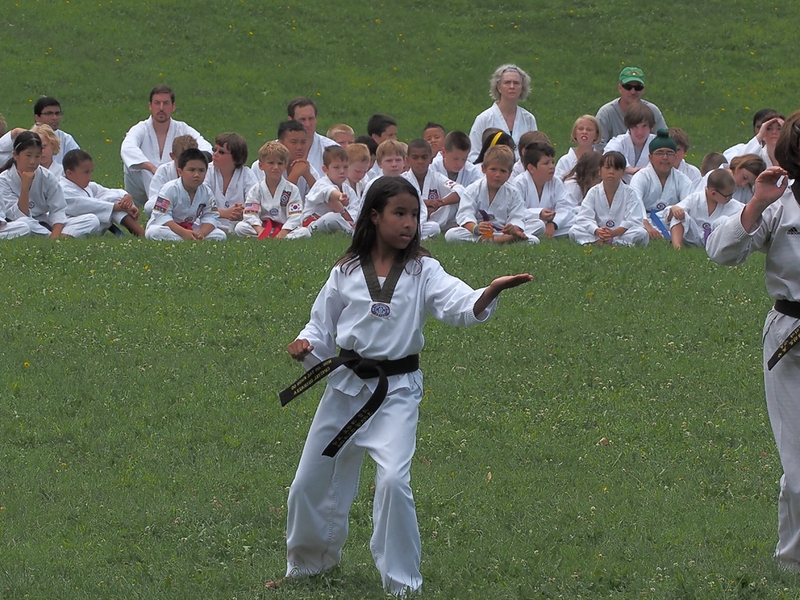 Kihap (the yell that is shouted when practicing Tae Kwon Do) is the hardest thing for a new student to do. The yell often sounds like “Haaaa!” or “Ahoe!” The kihap is designed to regulate breathing, and can be used to intimidate, distract, or startle your opponent which can cause the effect of “freezing” your opponent momentarily just prior to a strike. For me, I think of it as in terms of my personal statement. Me saying, “I’m here! Take notice of me! This is my space!” But even though, I’m not known to be shy, it took many classes for me to find my voice. I love that in Tae Kwon Do you are expected to be loud and defend yourself. I don’t know of any place else where you are not only given the right to defend yourself but it is expected. I used to be concerned that in a dangerous situation where there was a threat of being assaulted that I would lose my voice or become immobile. I don’t worry about that anymore. 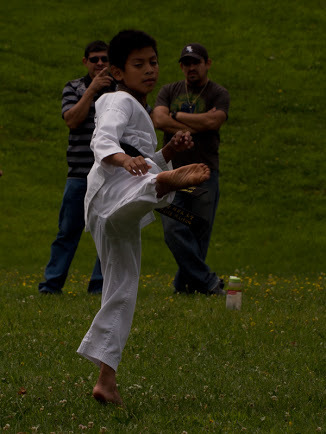 Tae Kwon Do has taught me what I can do. Role playing. I disarmed the bad guy. Sparring is my favorite discipline of Tae Kwon Do. I enjoy when I can kick a person in the head. That accomplishment hasn’t come without me being on the receiving end of a few black eyes, bloody noses and sore ribs. Still, there isn’t any quit in me. A part of the membership oath of Kor-Am Tae Kwon Do School is that we are united in mutual friendship. I feel a kinship with everyone from the youngest member to the oldest member, belt and age-wise. And especially with the people on whom I get to practice my strikes.